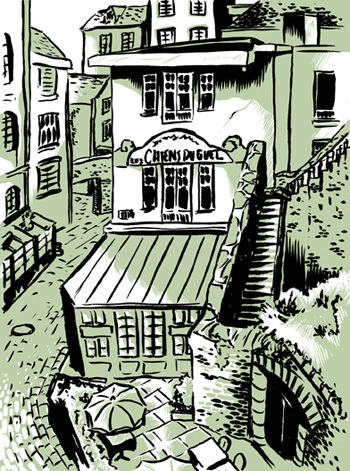 This sketch was done from a photo I took in the walled city of St-Malo on my last trip to France in ’03. This is from the top of the wall looking down on the hotel in which I stayed. The sign says “Chien du Guet”, which I think means “watchdog”. Things were a little slow at work so I did this to occupy my time. Sketched with my Pocket Brush and the scanned and colored in Photoshop. I was mostly inspired to do this sketch by the amazing Back Alleys sketches on Michael Cho’s blog. Though my efforts pale in comparison.